Hey there. Long time no Axe Cop. As you can imagine, I have a ton of unused material from old notes I took in the days when we were making Axe Cop regularly. It takes about 10 minutes to say this stuff, but months to draw, so I had to “chop” some thing. But a lot of it I still love and I always wanted to do some kind of project where I at least share it in snippets, do some sketches , and get it out there, even if it doesn’t ever make into a complete story. So, here is the first installment. About Wexter’s dad. I got out the old notes and did a few sketches. This is his introduction. 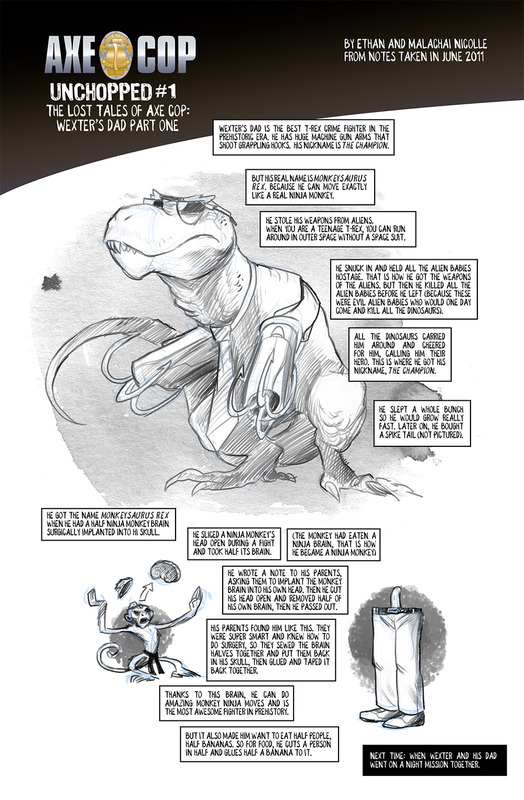 We wrote a whole mission that Wexter and his dad go on together, which I will release in installments because there is a lot of great stuff in it. I hope to release these weekly, but we’ll see. 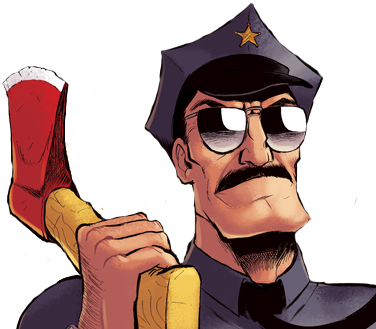 Thanks for keeping up with Axe Cop! I’m just gonna sit here and be happy for a while. Awesome! Really looking forward to more of this Unchopped material! Haha, awesome and hilarious stuff as always. Half a ninja monkey brain, or a half-ninja monkey brain surgically implanted into… Hi, Skull! This is hilarious–Wexter’s dad sounds amazing.